Ithilien Pt. 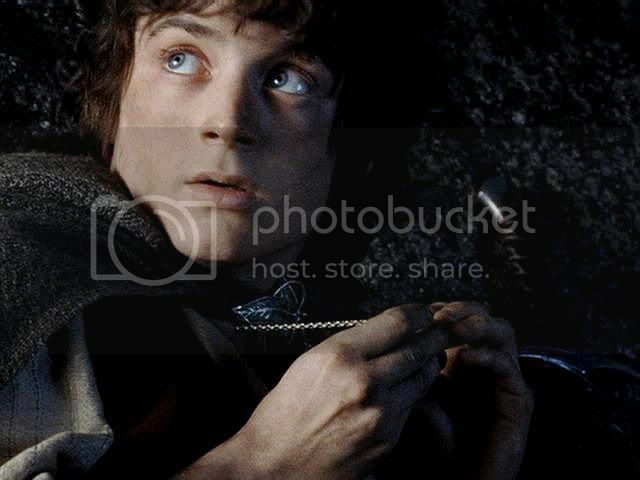 1: Frodo ponders the Ring ~ plus jan-u-wine’s “Too Often”…. Here begins the last of my RotK screencap posts, marking the home stretch of this long-running project (only about 35 entries to go). Because of the way it opens up the meaning of these caps, I am also posting jan-u-wine's Too Often. It appears below the screencaps, and is not to be missed. I have already capped quite a few of Frodo's scenes from RotK, some from the Plain of Gorgoroth, the “I can see the Shire” scene after the fall of Barad-dûr, the Eagles scene, and all the scenes at the end of the film after the coronation (see the “All Frodo and Elijah Screencaps” link at the bottom of this and every post for a list). 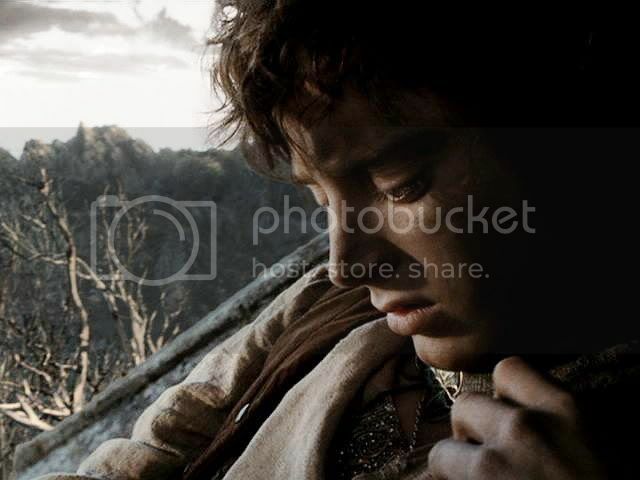 Note: Speaking of the “All Frodo and Elijah screencaps” link, because this table of links has become very large, it takes a very long time to load. Therefore I plan to subdivide the table into smaller tables, interlinking them: one for each LotR film, one for the behind-the-scenes and extras caps, and one for the caps of Elijah Wood in other roles. I will post an announcement when I do this, just in case anyone is trying to use the links at the bottoms of entries. It will take a while to go through and change all those links, since there are now more than a hundred and twenty of them. However much I love Howard Shore's score for the opening of RotK, I have mixed feelings about the scene in which Gollum's history is told. 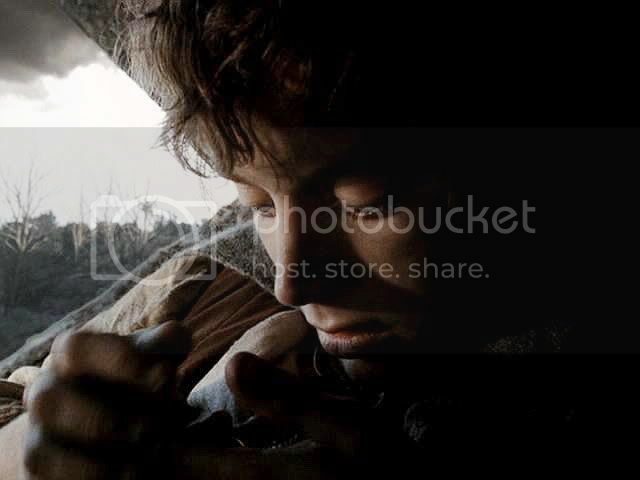 Coming just after that, all the more is Frodo’s first scene one I really love. 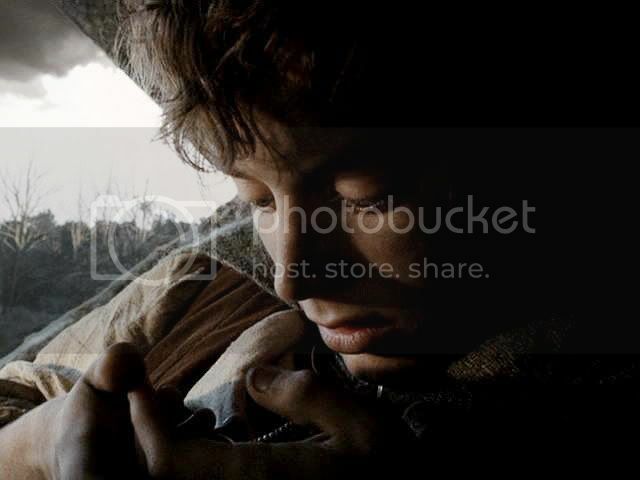 The scene doesn’t have a direct parallel in the book, but it picks up the mood of impending gloom and darkness that permeates the chapter in which Frodo and Sam leave Faramir and what is, essentially, the last homely house of the West before they enter Mordor. 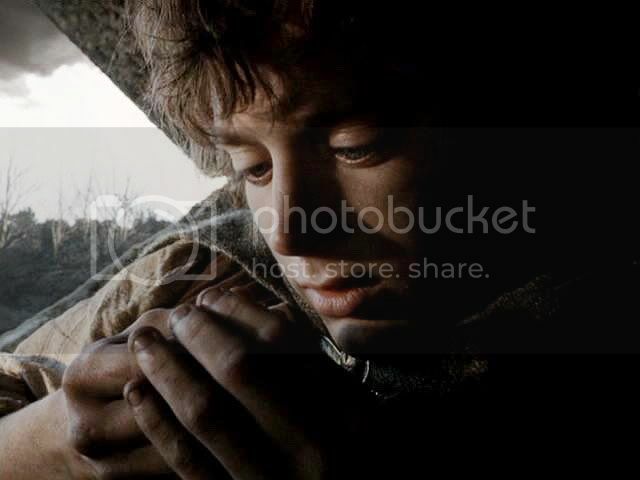 It also conveys a sense of the book’s portrayal of Frodo as a character who is more and more difficult to read as the Quest becomes darker. 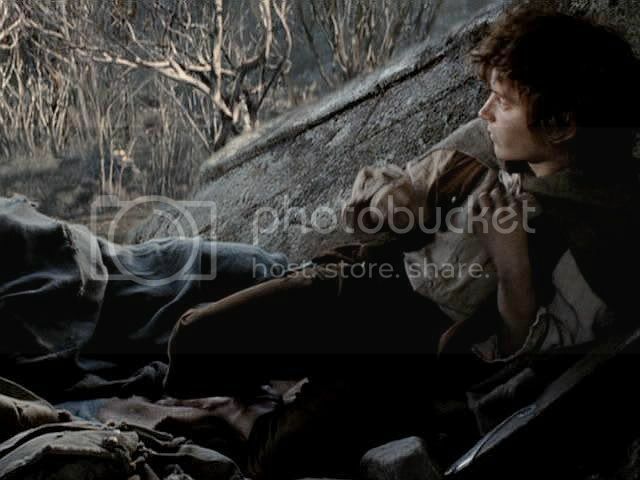 The film scene is presented as a sort of parallel to the TTT night-time scene in the Dead Marshes in which Frodo relates to the Ring as if he were a courting lover. All is quiet and, as in the Marshes scene, Sam is asleep and Gollum nowhere to be seen. 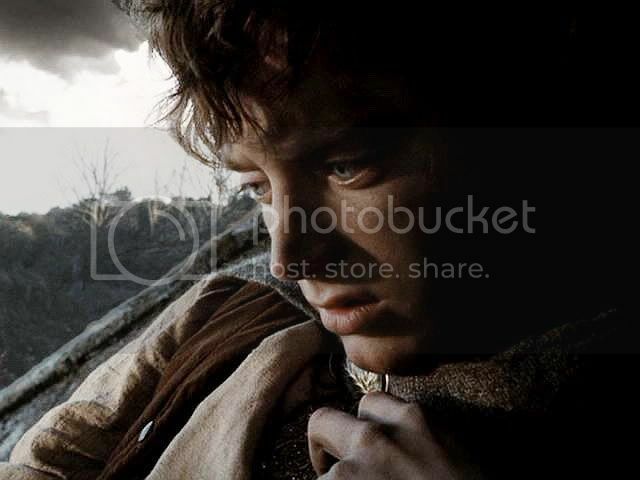 Frodo is alone with his thoughts. The camera moves the viewer closer, offering a picture without words of what Frodo is experiencing. The action is basically the same as in the Dead Marshes, but the tone is very different. 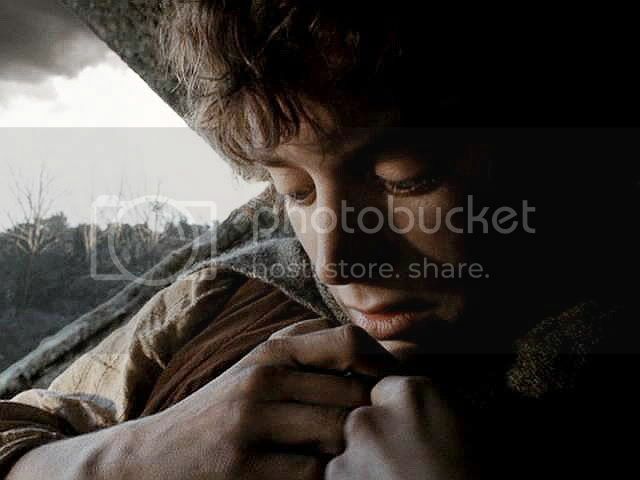 No longer does Frodo gaze at his “treasure” like a smitten lover, fondling it in pleasurable reverie. He seems well past the “so bright, so beautiful” stage of his relationship with the Ring. But he is not less enthralled. He grimaces with pain as he rubs his neck where the weight of the Ring has made it raw. 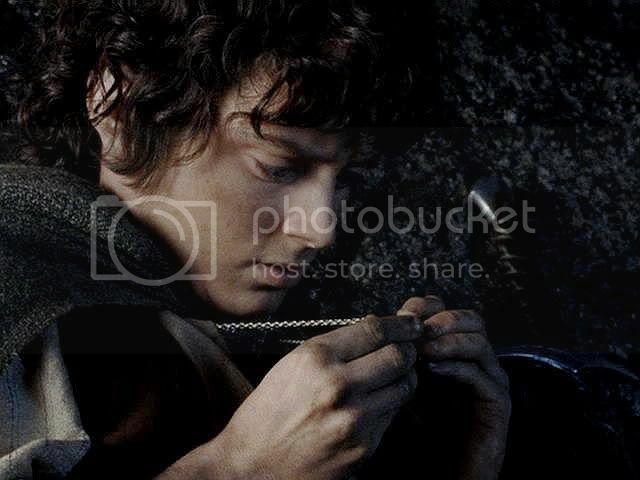 But glancing around furtively, to make sure no one sees him do it (perhaps, especially, Sam), it seems as though Frodo can't wait to pull the Ring from its hiding place. As in the Dead Marshes, he turns it over in his fingers. He examines it briefly but intently, soon interrupted. But the touching is not the rhythmic stroking of the Marshes scene. It's more like he is checking it—perhaps to reassure himself that it’s still there, and still the Ring: solid and real. And still, in a sense, his. 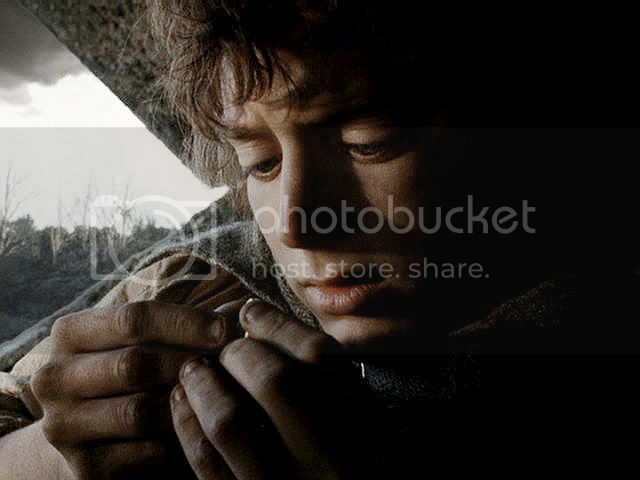 The genius of the moment is that although it is vivid, it is evocative, not explicit, leaving the sense up to the viewer, all of whom have their own ideas at to what Frodo is thinking. There is no film script to accompany these particular caps, since actual dialogue doesn’t take place until Sam wakes up (in the next post). Below I have posted an excerpt from the book, to help establish the mood and look of this sequence, even though it is not identical to what ended up in the film. I thought the film design people (visual and sound editing) did a great job portraying a land at the edge of awakening, spring just about to burst forth, yet held back, as if in suspense: brooding, watchful, a bit bleak, as if the land had experienced a late frost. As usual, the caps (made from the “full screen” version) have been adjusted for lighting and focus. I might add that the caps are beautiful simply as images: wonderfully lit and shot for the ultimate in moody introspection, featuring the king of moody introspection himself. Without exaggeration, scrolling through them makes me a little breathless. I am awed both by Frodo's expressive beauty and by the skill of the film artists, whose combined skills made the scene what it is. Book scene, from The Journey to the Cross-roads. 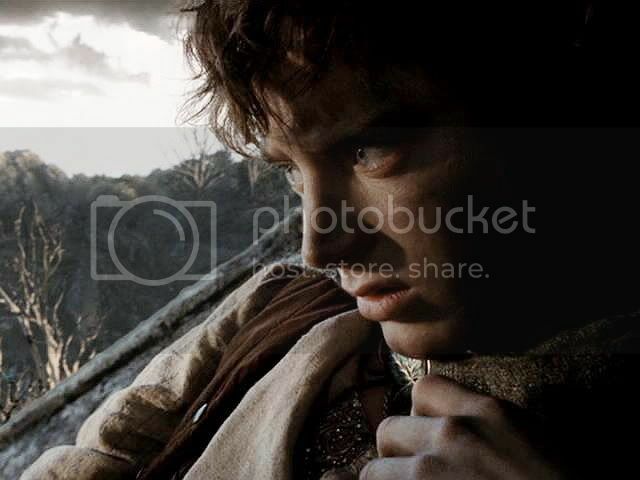 Having parted from Faramir, Frodo and Sam follow Gollum into Ithilien and growing darkness. The sun rose and passed overhead unseen, and began to sink, and the light through the trees to the west grew golden; and always they walked in cool green shadow, and all about them was silence. The birds seemed all to have flown away or to have fallen dumb. Darkness came early to the silent woods, and before the fall of night they halted, weary, for they had walked seven leagues or more from Henneth Annûn. 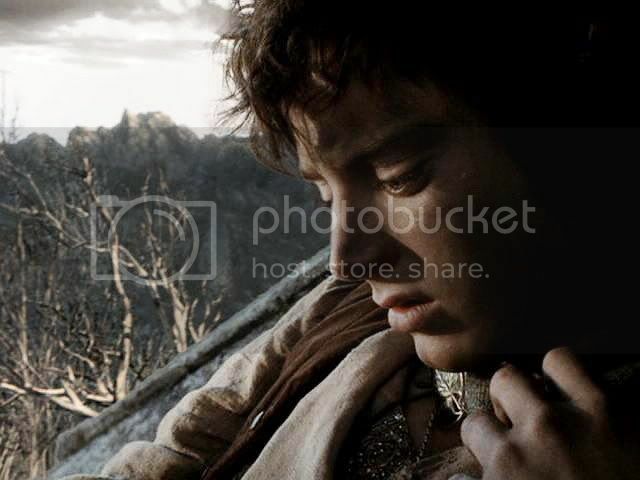 Frodo lay and slept away the night on the deep mould beneath an ancient tree. Sam beside him was more uneasy: he woke many times, but there was never a sign of Gollum, who had slipped off as soon as the others had settled to rest. Whether he had slept by himself in some hole nearby, or had wandered restlessly prowling through the night, he did not say; but he returned with the first glimmer of light, and roused his companions. That day passed much as the day before had gone, except that the silence seemed deeper; the air grew heavy, and it began to be stifling under the trees. It felt as if thunder was brewing. Gollum often paused, sniffing the air, and then he would mutter to himself and urge them to greater speed. Light was fading fast when they came to the forest-end. There they sat under an old gnarled oak that sent its roots twisting like snakes down a steep crumbling bank. A deep dim valley lay before them. On its further side the woods gathered again, blue and grey under the sullen evening, and marched on southwards. To the right the Mountains of Gondor glowed, remote under a fire-flecked sky. To the left lay darkness: the towering walls of Mordor; and out of the darkness the long valley came, falling steeply in an ever-widening trough towards the Anduin. 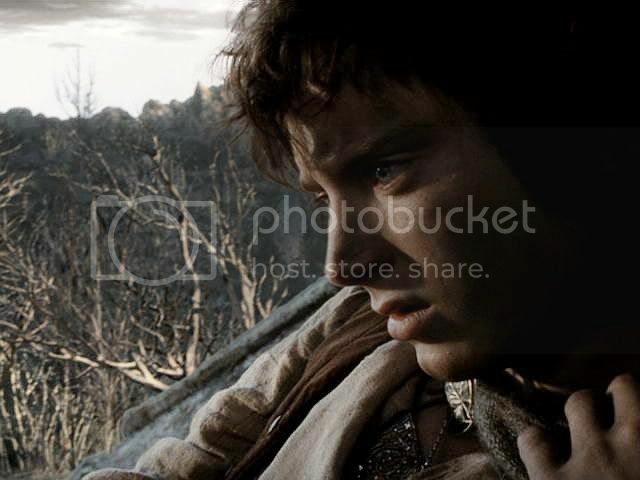 At its bottom ran a hurrying stream: Frodo could hear its stony voice coming up through the silence (…). He turned to Gollum. ‘Do you know where we are?’ he said. The three of them climb into the many-branched crotch of an huge holm-oak and rest there until midnight. As soon as they were down they went on again with Gollum leading, eastwards, up the dark sloping land. They could see little, for the night was now so deep that they were hardly aware of the stems of trees before they stumbled against them. 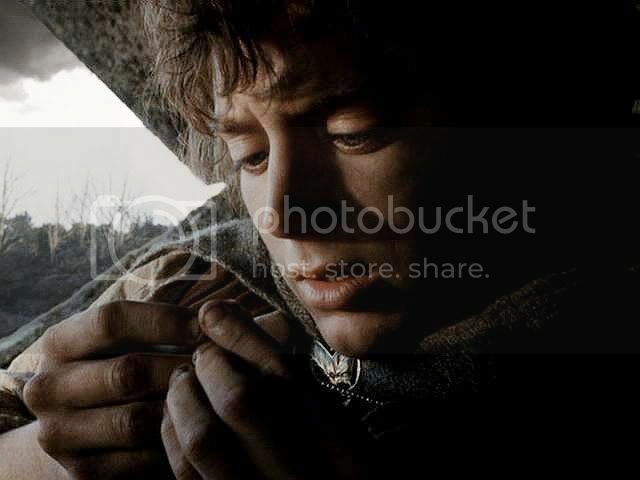 The ground became more broken and walking was more difficult, but Gollum seemed in no way troubled. He led them through thickets and wastes of brambles; sometimes round the lip of a deep cleft or dark pit, sometimes down into black bush-shrouded hollows and out again; but if they ever went a little downward, always the further slope was longer and steeper. They were climbing steadily. At their first halt they looked back, and they could dimly perceive the roofs of the forest they had left behind, lying like a vast dense shadow, a darker night under the dark blank sky. There seemed to be a great blackness looming slowly out of the East, eating up the faint blurred stars. Later the sinking moon escaped from the pursuing cloud, but it was ringed all about with a sickly yellow glare. Gollum leads them up on to a great hog-back of land covered with thick growth under which the hobbits could walk upright. But no day came, only a dead brown twilight. In the East there was a dull red glare under the lowering cloud: it was not the red of dawn. Across the tumbled lands between, the mountains of the Ephel Dúath frowned at them, black and shapeless below where night lay thick and did not pass away, above with jagged tops and edges outlined hard and menacing against the fiery glow. Away to their right a great shoulder of the mountains stood out, dark and black amid the shadows, thrusting westwards. It was his turn to sleep first, and he was soon deep in a dream. Jan-u-wine’s Too Often is posted below the screencaps. The narrative poem was written to portray Frodo’s thoughts about the Ring, but a little further on in the story. Nevertheless, I thought it and the screencaps set each other off so well I asked Jan if I might post it here. Graciously, she said yes. 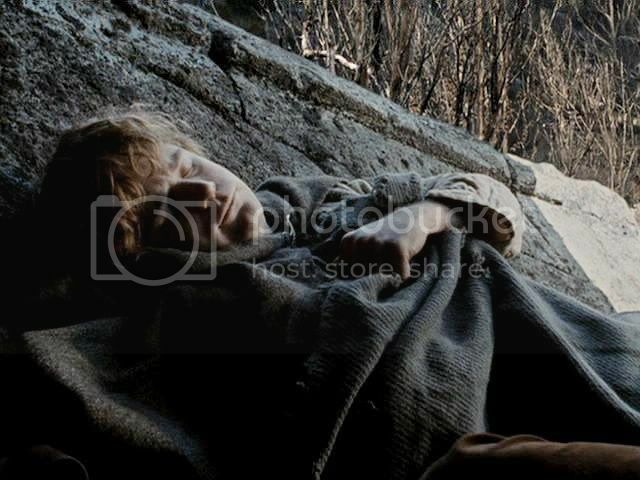 ~ In Ithilien, Sam sleeps as Frodo ponders the Ring. what I am to It. Watching this scene, I always get a weird sense of what I can only describe as numbness. Maybe it's partly due to the score which, IIRC, has a long note held by the string section that subsumes the rest of the music, and perfectly reflects Frodo's expression. 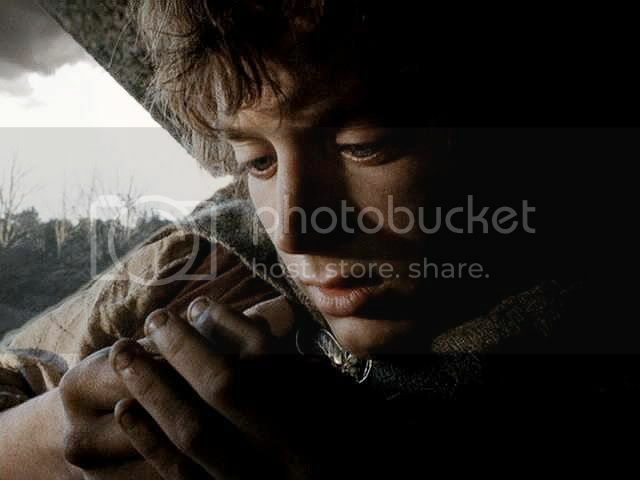 I don't know exactly how Elijah manages to convey the sense that Frodo's conscience self is numbed to all else but the ring's lure. Maybe it's that his eyes are the only thing moving in that slack face, reflecting furitiveness and emptiness. However it was done, this scene evokes an eerie mood in me everytime I watch it. Oh, Honey, I'll have to re-watch it! Since I was screencapping, there was no sound on to remind me what the scoring sounded like. He's wonderful in this scene, even if it's just a few seconds long. And I adore the composition of the frames--the lighting, the background sky--everyone involved did a great job. Heartbreaking but beautiful screen caps, Mechling. I felt my heart clench whilst reading jan-u-wine's potent poetry. Estë, I agree. He is superb in this moment, conveying so much with so little. I just gushed to HoneyElf (Ms. Banazira) above that I loved the whole "product" -- all the craftspeople did an excellent job producing this sequence. I'm going out for the day so only have time for a few brief comments. This is such a beautifully shot scene, charged with emotion and depth. And Howard Shore's music IS eerie. The whole scene is eerie, and oh so sad. And on a lighter note: that MOUTH! That gorgeous, kissable mouth. 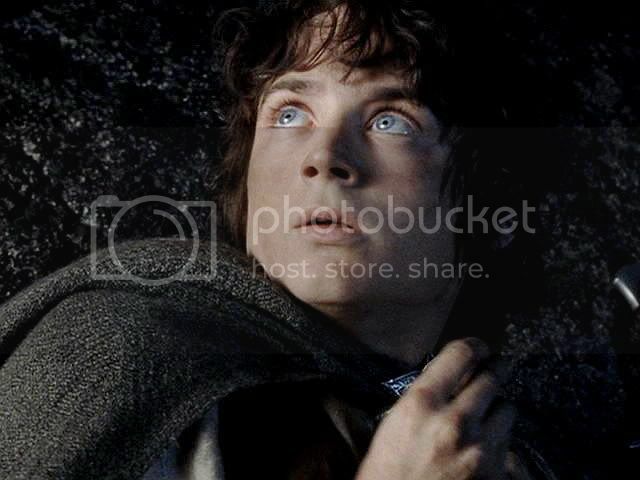 It has occurred to me that Film Frodo's beauty is a welcome distraction for me. 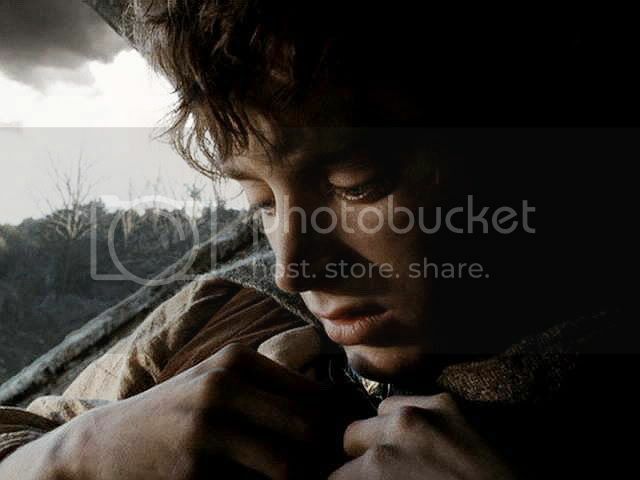 Because what Frodo goes through as a character is so awful - more awful in the book - and bleak and sad that I prefer not to dwell on it too much. So I choose to dwell on Frolijah's bee-stung lower lip instead. Jan's poem is amazing, as always. Brilliant, Jan. Dark and brilliant. Oh, you're not the only one to gaze upon the Mouth in the midst of its wearer's travail, Pearl. *g* I was joking with Jan when letting her see a couple of caps (in case she might want to write a poem for them) of the scene in which Frodo suffers mightily hiding with Sam near the gates of Minas Morgul (as the Witch King screeches and the Fell Beast bellows), he sure does look good when he's under extreme duress. Even as I weep for him, my smitten self says, "Mmmm, mmm, mmm". 35 more entries, not caps! There are "so many of them", as Frodo said. But not Orcs, caps. Heck, there are 8 sets of Shelob's Lair alone! And more than that of the scene in the Sammath Naur (the scene that made me faaaaaaallllll). I think this is one of Jan's best poems. I know I keep saying that, but it is. 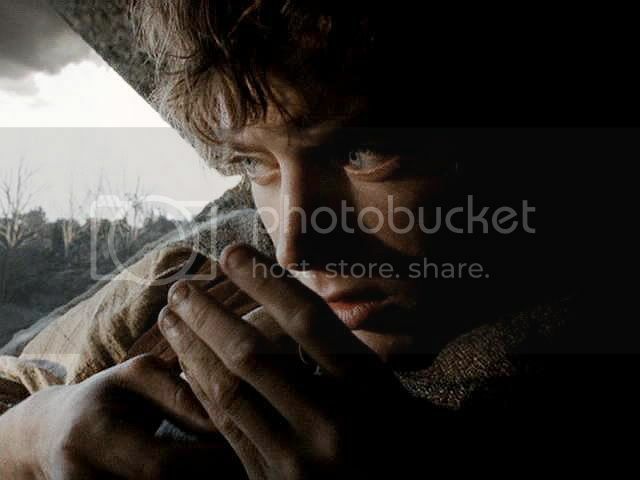 I love the image of the Ring here: "as It turns upon the paths of my mind" -- as if I can see the image of it at Frodo sees it in his own mind. It's so vivid. Thanks so much for commenting, Mews. Yes, jan-u-wine has a real gift. I'm so grateful it got poured out for Frodo and LotR! When we get to "Go Home, Sam", I'll surely mention the objection you raised here. Back when RotK was being argued on my old messageboard, even "revisionists" (book fans who could like the films even though a lot of changes had been made) found it difficult if not impossible to swallow that Sam would actually follow Frodo's crazed command. But we'll save that for later. Yes, Elijah does Tormented well. More than well--wonderfully! The book–passages you have used for this entry perfectly compliment the screencaps, Mechtild. I very much enjoyed reading your commentary too. Your observations are, as always, thoughtful and perceptive. Jan’s poem is so, so poignant. I agree that Elijah is wonderful here. Like Pearl (I love the ‘bee-stung lower-lip!! !’), as I scrolled down the screencaps I found my gaze being drawn to ‘the Mouth.’ How can someone in such torment be so beautiful? Ah, Blossom, thanks so much for commenting! I saw in Whiteling's LJ that it's your birthday, too. Many happy returns of the day! Yes, it's a wrenching poem, but so real. 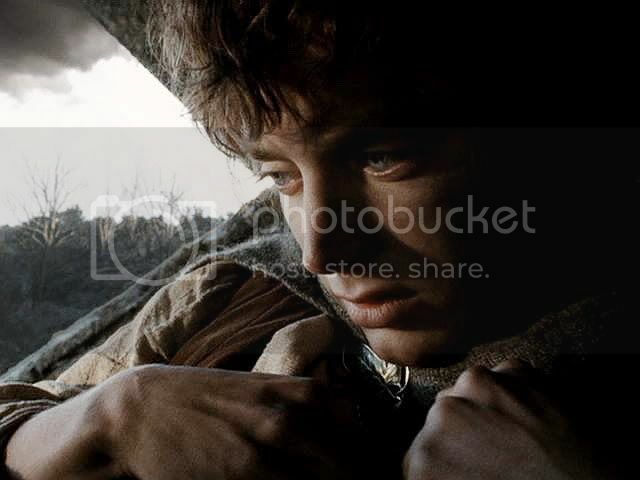 I love the way Jan seems able to "channel" Frodo, getting right inside him in a subtle but precise way, able to give us such vivid, affecting glimpses into his psyche, even his soul. And, yes, no one looks more luscious in the midst of torment. No wonder he's inspired so much angsty fanfic, gen or highly-rated, in which he suffers everything and anything imaginable in (or out of) Middle-earth! Thank you for the birthday wishes, Mechtild. 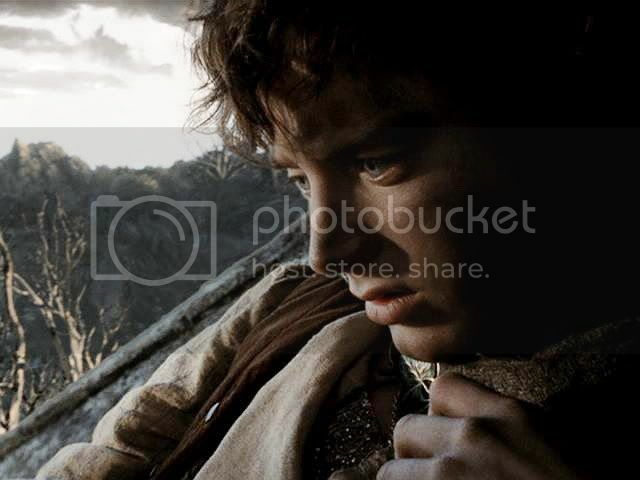 I wiled away part of the evening here in your LJ, drinking in the beauty that is Frodo. I did have a beverage (or three) of the alcoholic variety to hand, I might add. Jan certainly has a unique talent. Her poems are both powerful and touching. I also very much enjoy reading your commentaries, rich as they are with interesting observations, and beautifully written. Ah, Blossom, you enrich my appreciation of LotR and the films. I would still do this, and still love the films [however imperfect] whether anyone responded with understanding or not, but comments like yours hearten me, that there are still people out there who really love this stuff--the book, the films and the hobbit of hobbits. Thanks so much for commenting.